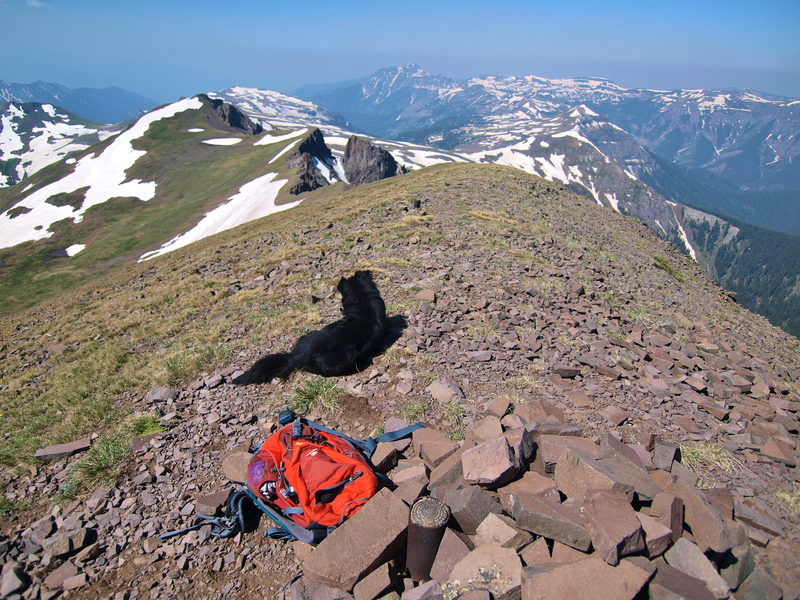 This past weekend I climbed 13,330-foot Summit Peak in Colorado’s San Juan Mountains. It was one of the best days of my life. Summit was a beast of a climb: over 5,000 feet of elevation gained, most of it off trail, but I felt strong the whole way to the top and back. Feeling at home on a mountain like that is truly an extraordinary experience. My first experience traveling at altitude came in Ecuador in 2008 during a two week climbing blitz up three mountains: 15, 969-foot Gua-Gua Pinchincha, 18,996-foot Cayambe and 19,347-foot Cotopaxi. Our group of 11 college students and 5 guides all made it up Gua-Gua (pronounced Waa-Waa), but on Cayambe and Cotopaxi, I watched everybody but three of the five guides succumb to crushing headaches, crippling nausea, and general dizziness and disorientation, classic symptoms of altitude sickness. Once altitude sickness begins, you can’t fight it. Remaining at altitude will only bring drowning in the lungs, swelling of the brain and, potentially, death. The only cure is to descend. On Cayambe and Cotpaxi, one by one, all the other climbers turned back. But altitude sickness never came for me and I was the only climber on the trip to summit all three peaks. 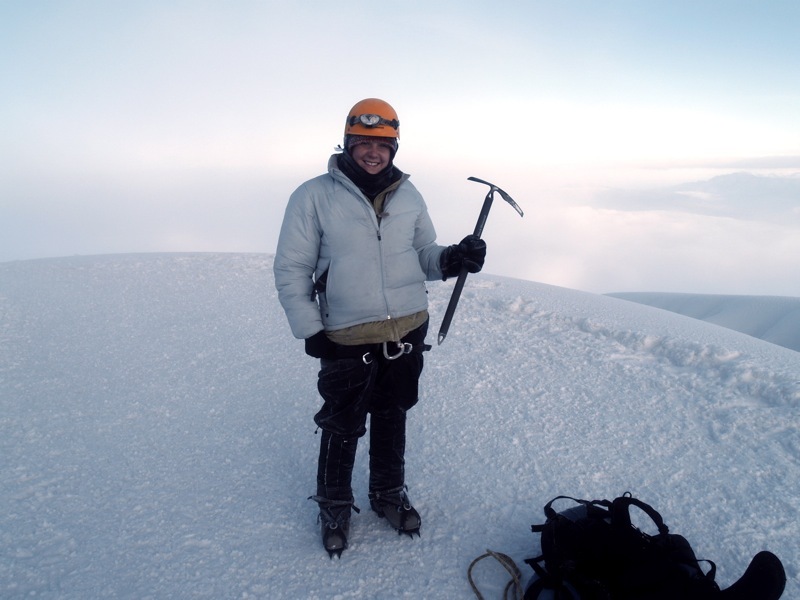 Me on Cotopaxi: Still breathing steady at 19,400 feet! I don’t know why I did so well at altitude in Ecuador. Before that trip, I had never been above 4,000 feet. All of the other students on the trip were younger than me, college-aged to my 26, and most were in better shape; several were varsity athletes. But the physiological gift for traveling in high places is not one I have squandered. Since that trip I have climbed many mountains and I have yet (knock on wood) to experience anything but minor shortness of breath. I have also found my tolerance for physical misery is extraordinarily high. No matter how tired, wet, or cold I get on a mountain, I have never reached the point of utter, abject despair that brings tears. Shivering in a driving sleet storm, if offered a chance to trade my circumstances for a couch, a blanket and a decent movie, I’d say no thanks. The mountains is where I most like to be, physical discomfort be damned. All mountains involve risk and I’ve had some close calls. Descending the Pedernal on my birthday I ended up in the wrong drainage ditch and ended up having to climb most of the way back up the mountain a second time to find my bearings. On the way up South Sister in Oregon’s Cascades, I stumbled and nearly plunged off the side of the volcano into oblivion. Coming down into Blodgett Canyon from a pass on the border of Montana and Idaho, I surprised a mother moose and came sickeningly close to getting my head kicked off my shoulders. I’ve twisted ankles (keep walking), been attacked by bees (run! And then keep walking) and shed buckets of sweat and quite a bit of blood, but never tears. 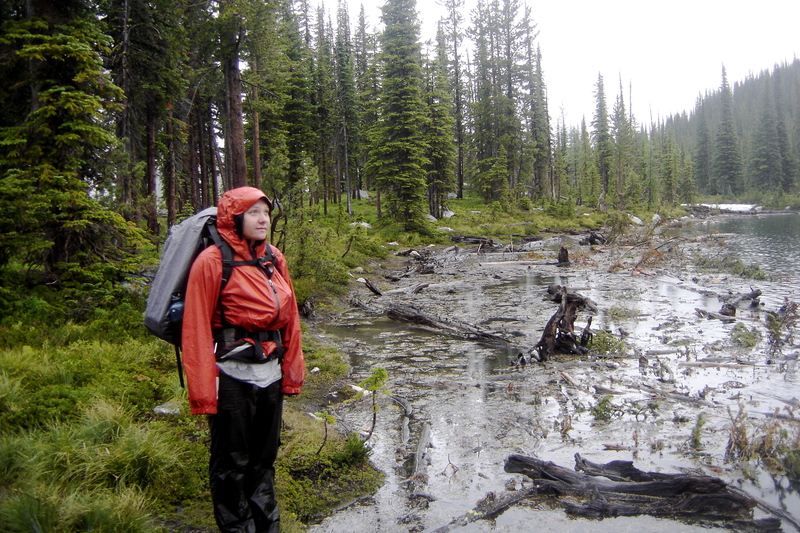 Soaking wet in Montana and exactly where I want to be! When I tell people that I am a mountaineer, they often ask me when I’m going to climb Everest. I have no desire to stand in line up to climb that much-abused, trash and body-littered summit. For me, climbing isn’t about taking risks, ticking off summits and accumulating bragging rights. I have no desire to climb any mountain just because it is an est: highest, hardest, steepest, deadliest. In fact, if I never go higher than Cotopaxi again, I’ll be just fine with that. The joy of climbing lies in traveling to untrammeled, rarely visited heights, no matter how high. But man, oh man, the air up there at 13,330 feet was so sweet! 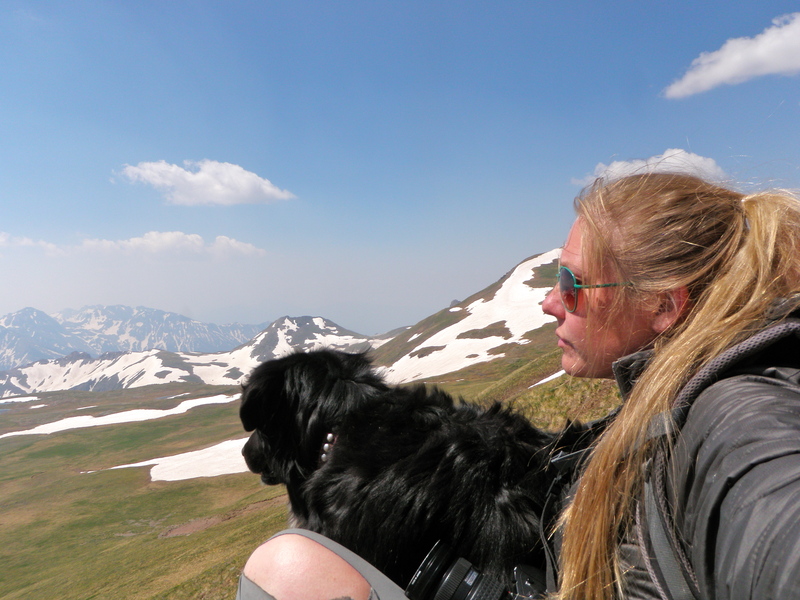 This entry was posted in Bowie & D.O.G., Hiking!, Vagabonding 101 and tagged Cayambe, climbing, Colorado, Cotopaxi, dogs, Ecuador, hiking, mountaineering, mountains, San Juans, solo, Summit Peak. Bookmark the permalink. Jack here. Your account of your tolerance for physical misery sounds a bit like Cal Ripken and his father. Cal’s father was much like Cal – he never missed a day of work. They both had a high tolerance for pain. You account also reminded me of Lance Armstrong and how his cancer changed his body and made it better able to process oxygen.